2019 Wholesale Volume Through Digital Channels Expected to Increase While In-Lane to Drop Slightly - Cox Automotive Inc.
Like 2018, this year is poised to be a great year for offsite digital volume growth. Dealers do not need to consign as many vehicles when there is strong retail demand. In 2019, the total volume of wholesale units requiring disposal is forecast to peak at 16.9 million units, although the number of vehicles going through auction lanes is forecast to drop slightly in 2019, after peaking in 2017. The wholesale market plays a central role in facilitating the flow of used vehicle inventory. Like 2018, this year is poised to be a great year for offsite digital volume growth. That does not mean traditional auction volume will collapse, but growth in the flow of vehicles will favor non-tradition channels and not the physical lanes. Dealers do not need to consign as many vehicles when there is strong retail demand. Repossessions have only slightly increased even with record amounts of outstanding loans as defaults remain low with very low unemployment and higher disposable income. Rental risk sales are down as rental car companies are selling fewer vehicles and moving more rental risk sales direct to consumer. In 2019, the total volume of wholesale units requiring disposal is forecast to peak at 16.6 million units, although the number of vehicles going through auction lanes is forecast to drop slightly in 2019, after peaking in 2017. 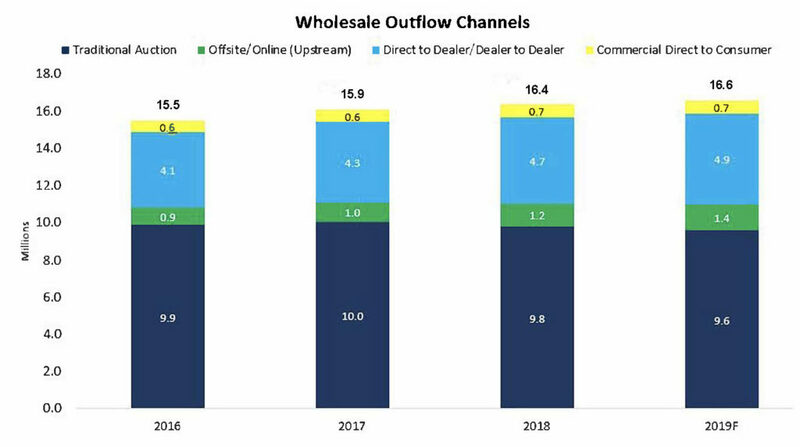 Upstream and dealer-to-dealer transitions will grow versus 2018. Sign up here to receive updates on news and trends dominating the automotive industry.